There are a ton of online furniture sites that sell everything from small deco items to large pieces of furniture. Each site of the genre has its own style. Some are modern, some are industrial, some are trendy, and others are jumbled. Prices vary and shipping costs do too. This list features our top recommendations for the best online furniture sites to find everything that you’re looking for all in one place. Restoration Hardware is the place to go if you’re searching for something for every room of your home, in all sorts of styles. On this site, you will find a ton of collections that range from daybeds to benches to bedding. On Restoration Hardware, you can find paint, holiday decor, chandeliers, fabric by the yard and a whole lot more. Search the site to find discounts and savings up to 70% off retail cost and become a free Restoration Hardware member to get an extra 20% off your next purchase and a ton of additional perks. Shipping to both Canada and the United States is available with this amazing place, prices vary but everything is explained in detail on their shipping and delivery page. Once in a while, you will find free shipping deals on minimum orders search their homepage to see if one’s available. If you like finding big and small items for your entire home all in one place and saving a ton of money in the process, check out our list of furniture stores similar to Restoration Hardware below, you’ll love them all, guaranteed. Pier1 is a company that travels the globe to find unique items in all sorts of colors, styles, and designs. This online retailer has accents, furniture, bedding, candles, storage, and more but their quantities run out fast. If you’ve found something of interest on the Pier1 site, grab it fast because a new collection is just around the corner. On this site, you can find a ton of savings, even up to $100 off. Pier1 will ship for free on all orders over $49 within the Continental United States. This company can ship to other places but you will have to browse their site to learn more about the location you’re inquiring about. If you love to decorate your home in a modern way, you’ll love Dot & Bo. 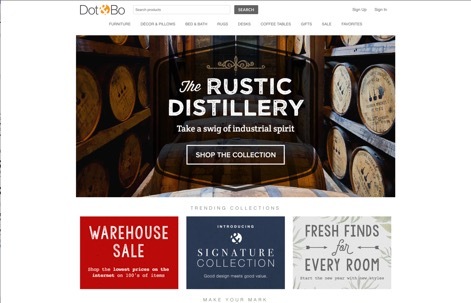 Dot & Bo is the place to go to find furniture and decor for the modern lifestyle. On this site, you will find things for every room of your home that ranges in style from mid-century to bohemian to industrial. Dot & Bo has savings up to 60% off retail cost and their shipping is very affordable. Check out the free shipping page to find all the items that can be shipped without cost. Add your email to their mailing list to receive personalized curated collections that will help inspire you the next time you feel like a little home redesigning. You might already be shopping at Target for all your home essentials, clothing, and home decor items. 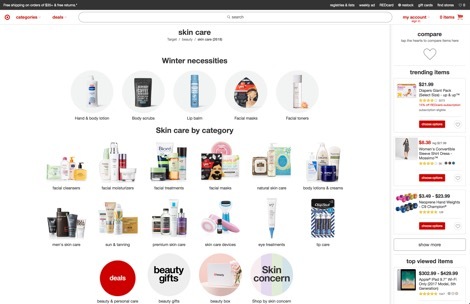 Did you know that Target has a website too with exclusive items that can only be found online? Target is the place to expect more and to pay less. Target has electronics, baby items and everything in between. On this site, you will find the brands you love, and some that you’ve don’t know about that should be discovered. Target ships for free on all orders over $35 and exchanges are always hassled free. 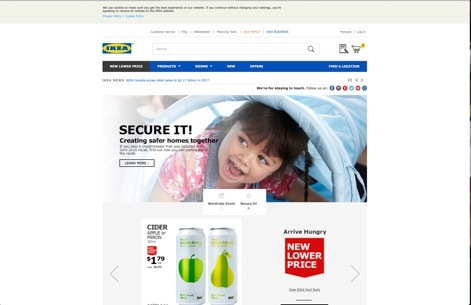 IKEA is known for its affordable home furnishings and its ready to put together furniture. IKEA is another one of the best online furniture store sites like Restoration Hardware is also a great place to find all the containers that you need to help organize every space in your home. Items from this Swedish company that’s been around since 1943 can be found in numerous homes around the world. This site specializes in furniture that can be put together quickly and they all of their furniture, accessories, and appliances are available in numerous colors to help bring your home design to life. Every time that you visit this site, you will find amazing discounts and deals and their shipping is very affordable. Check out IKEA now to find a ton of things to help redesign your home, you won’t be disappointed. The Zara Home site is one of the best places to add harmony and style all throughout your home. On this Restoration Hardware alternative, you will find things like home decor, bedding, towels, fragrances, accessories, and big pieces of furniture too. Zara Home adds a new collection each season that will help inspire you to create something of beauty in your home. This site has a ton of sales that can rise up to as much as 70% off. 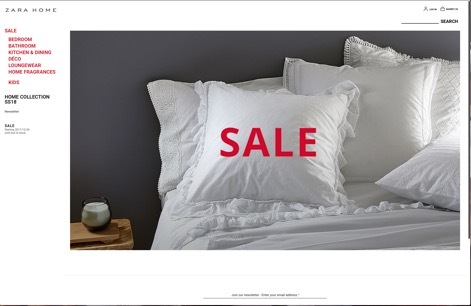 Zara Home can ship internationally at very affordable costs. Add your email to their mailing list to get the latest news on the up and coming collections. Joss & Main is such a great site that you might even think that it’s too good to be true. This place like Restoration Hardware has some of the best furniture online and some of the best savings too. Joss & Main can help you get the picture perfect style you’ve been searching for, without paying the high prices you were expecting. On this site, you can find discounts up to 65% off the retail cost on all the styles you’ve been searching for, even the newest additions. 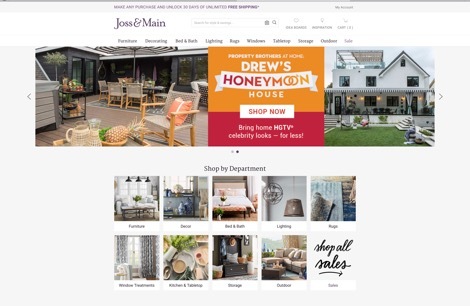 Joss & Main offers free shipping on all orders over $49 so there’s no reason not to check out this site now. If you’re looking for home decor items and furnishings for your indoor and outdoor area, Pottery Barn can help you out. This recommendation found on our list websites like Restoration Hardware features expertly curated collections for every budget. Pottery Barn has something for every room of your home, and more. 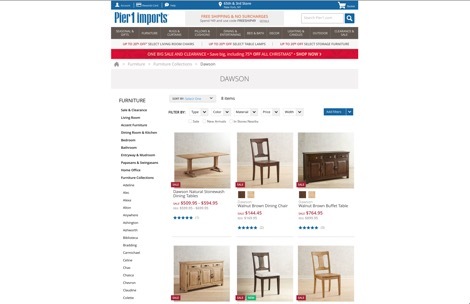 This furniture website has thousands of items in their collection and more add added all the time. 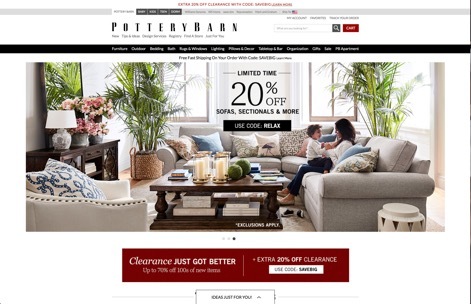 The Pottery Barn shipping costs vary but their prices are very competitive and if you scour their homepage, you might just find a code for free shipping or additional discounts on the things that you want to purchase.